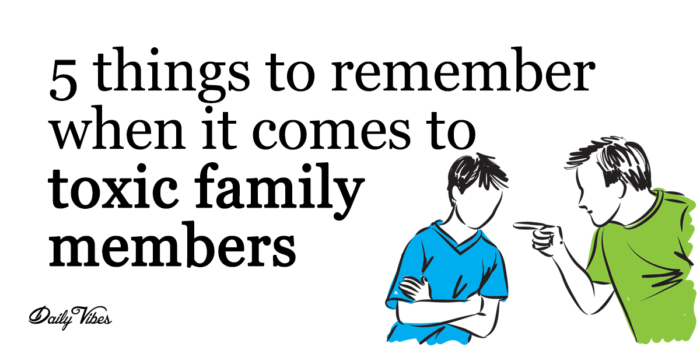 5 Things To Remember When It Comes To Toxic Family Members. There is a lot of advice to be found about getting rid of a toxic friend, boyfriend or girlfriend. But what do you do when you have a toxic family member? When it comes to family, you are sometimes not in a position where you can just break off the relationship and walk away. Or maybe we don’t really want to walk away or will feel horrible if we do. So, what do you do? 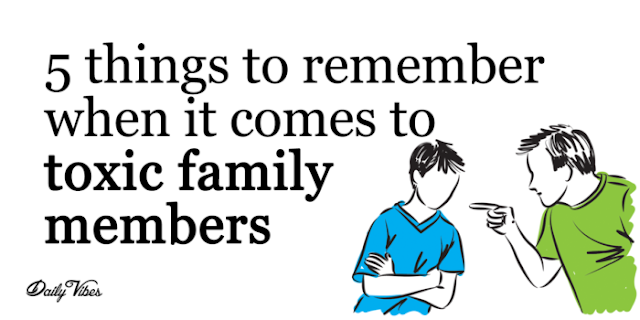 Even though not every case of dealing with a toxic family member is the same, there are some universal principles you need to remember. Below are 5 things to remember when dealing with toxic family members. Toxic family members sometimes behave the way they do to get what they want. It’s just so much easier to give in than it is to fight it. Right? Wrong! Short-term ease equals long-term pain for you in a situation like this. Toxic people don’t change if they are being rewarded for not changing. Decide this minute not to be influenced by their behavior. Stop giving in to them or making special pardons for their behaviors. Constant drama and negativity is never worth putting up with. Just because their behavior is bad does not mean they are inherently bad people. Not all toxic family members are agonizing and uncaring on purpose. Some of them are people who truly care about you; people who have good intentions, but are toxic because their needs and approach towards life force you to compromise yourself and your happiness. As hard as it may be, you have to distance yourself. You simply can’t ruin yourself on a daily basis for the sake of someone else. You have to make your well-being a priority. Hating someone because of their toxic behavior just brings more toxicity into your life. Hate-filled grudges are for those who insist that they are owed something. Forgiveness, on the other hand, is for those who are strong enough and smart enough to move on. Nobody is perfect, people can change and toxic relationships can be healed in time. But, when trust is broken, which happens in nearly every family relationship at some point, it’s essential to understand that it can be repaired provided both people are willing to do the hard work of self-growth. It’s painful work and a painful time, and the impulse will be to walk away, especially if you believe that broken trust cannot be repaired. Finally, remember that this is your life. You may not be able to control all the things toxic family members do, but you can decide not to be reduced by them in the long run. You can decide not to let their actions and opinions continuously invade your heart and mind. Above all, you can decide whom to walk beside into tomorrow, and whom to leave behind today. In a perfect world we would always be able to fix our relationships with toxic family members, but as you know the world isn’t perfect. Put in the effort and do what you can to keep things intact, but don’t be afraid to let go and do what’s right for YOU when you must.